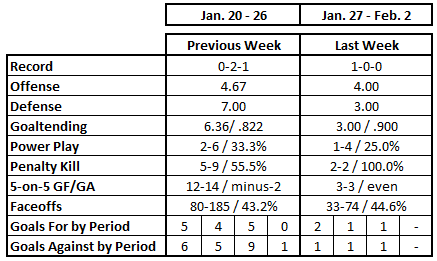 Even with only one game on the schedule, Week 18 was a “week” for the Washington Capitals. It was a good week, it was a perfect week, it was a week unlike any other preceding it this season (that “one game” thing). It makes writing a summary easy, because if you want to know how the week went, you can go here. -- That they won their only game of the week against the best team in the West – the Calgary Flames – would have been impressive enough. That they did it without their captain (Alex Ovechkin was suspended under league rules for opting out of the All-Star Game) and losing their third-line center (Lars Eller) to injury having skated barely six minutes for the night made it more impressive. -- The ornery manner in which the Caps finished the game against Calgary impressed as well. Brooks Orpik, while a physical defenseman, does not often engage in fights. Going into the game he had 15 regular season and two postseason fights in a 16-year career. But he went toe-to-toe with Matthew Tkachuk (seven fights in four seasons going into this game) for a scrap in which he was viewed by some as winning a narrow decision. What precipitated the dust-up might have been Nicklas Backstrom drilling Johnny Gaudreau into the back wall at the buzzer, perhaps some payback for an earlier collision. Even goalie Braden Holtby waded into the scrum of players at the end, evening out the 6-on-5 advantage in skaters that the Flames had. This was the “playing to the final horn” (and beyond in this case) that has been absent for the Caps disturbingly often this season. -- There are times when it seems that Evgeny Kuznetsov can flip a switch and turn into “Uber (or the Russian translation) Hockey Player.” There are also times that Caps fans wish he would flip that switch more often. Nevertheless, it was in the “on” position against the Flames, the game-winning power play goal in the last minute and an assist earlier in the game to his credit. What might have been at least as impressive was his ice time. After skating 6:29 in the first period, head coach Todd Reirden leaned heavily on him after losing Lars Eller to injury. Kuznetsov skated 10:00 in the second period and 8:07 in the third. Those two periods combined almost equaled his season average ice time (18:54). The 24:36 in total ice time was a season and career high for a regular season game. -- More evidence of playing to the final horn. Calgary went into the game with a plus-39 goal differential in the third periods of games this season, by far the best in the league. The Flames left the arena holding that same plus-39 goal differential, scoring a game-tying goal 12 minutes into the period, but yielding the Kuznetsov game-winner in the last minute. The Caps thus avoided losing what would have been a league-leading fourth game in regulation when leading after two periods. -- While it is nice to get that win coming out of the All-Star Game break and the bye, one should avoid getting too happy about it. The Caps won their first game coming out of last season’s break, too, a 5-3 win over the Philadelphia Flyers. However, the Caps staggered through a five-week post-ASG stretch in which they went 8-8-2 and did not win more than two consecutive games at any point in that stretch before peeling off a four-game winning streak in mid-March on their way to a 12-3-0 finish to the regular season. Another reminder that it is a long season. The Washington Capitals hit the ice for a Sunday matinee, hosting the Boston Bruins at Capital One Arena in a 12:30 start. The Caps are fresh off a 4-3 win over the Calgary Flames, ending a seven-game losing streak and posting their first win on home ice in more than three weeks. Meanwhile, the Bruins arrive in DC in a slump, losers of three in a row (the last two in extra time) and 2-3-3 in their last eight games, a slide that started with a 4-2 loss to the Caps in Boston on January 10th. That eight-game slump has been characterized by a clear divide in goaltending. Tuukka Rask has both of the wins over those last eight games, posting a 2-0-2, 2.53, .917 record in five appearances (one no-decision). At the other end, Jaroslav Halak is 0-3-1, 3.24, .850 in four games. Rask has been hot of late, despite suffering a concussion in the Bruins’ 3-2 loss to the New York Rangers on January 19th. He returned from that absence last Thursday, allowing three goals on 41 shots in a 3-2 overtime loss to the Philadelphia Flyers. Nevertheless, Rask is 6-0-2, 1.90, .937, with one shutout in his last nine appearances. 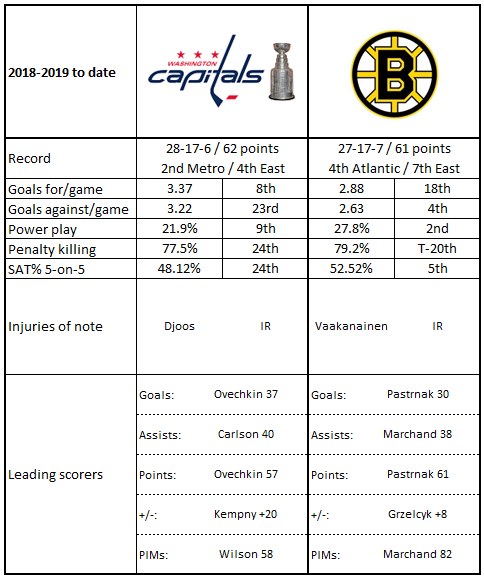 If Rask gets the start, it will be conflicting forces at work, his recent success versus a long history of despair at the hands of the Caps. He is 1-11-5, 3.30, .883, with one shutout in his career against Washington, including allowing five goals on 19 shots in 27 minutes of work in the Bruins’ 7-0 loss to the Caps on Opening Night, his only appearance against Washington so far this season. As for Halak, what stands out about his play of late is that he gets so little work on the road. He has only one road appearance among the eight he has had since shutting out Montreal in Montreal on December 17th, a 4-0 Bruins win. In that appearance he allowed four goals on 19 shots in a 4-3 loss to the Flyers in Philadelphia on January 16th. It is quite a turnaround from his early game log in which 12 of his first 19 appearances were on the road (nine of the Bruins’ last 11 games have been on home ice). Halak is 9-10-0, 2.80, .900, with one shutout in 21 career appearances against the Capitals. David Pastrnak is the latest entry in the “who is the next great goalscorer” sweepstakes. He reached the 30-goal mark for the season – his third straight 30-goal season – when he potted a pair in the Bruins’ overtime loss to the Flyers last Thursday. It was his first multi-goal game since November 26th, breaking a string of 26 games without one (he did have nine goals over that span) after opening the season with five multi-goal games in his first 24 contests. With his next goal he will become the fifth player in the league with at least 100 goals over the past three seasons, the others being Alex Ovechkin (119), Patrik Laine (105), Nikita Kucherov (101), and Connor McDavid (100). Pastrnak is 3-4-7, minus-12, in 11 career games against Washington, that minus-12 being his worst plus-minus rating against any team in the league. What the Bruins have not had much of in their eight-game slide is offensive contributions from the blue line. Torey Krug is the only defenseman over that span to have recorded a goal, that being the goal to open the scoring in the Bruins’ 5-2 win over the St. Louis Blues on January 17th, Boston’s last win coming into this game. Krug has established himself as a reliable point-producer since his 2013-2014 rookie season in which he finished fourth in Calder Trophy voting as the league’s top rookie. Starting with that season (14-26-40 – tops among rookie defensemen in all three categories – in 79 games), his 267 points ranks 12th overall among defensemen, and he has posted consistently higher point totals over the four seasons preceding this one (39-44-51-59). His 34 points in 40 games this season would put him on a pace for a fifth consecutive season of improvement, but he missed the first 11 games of the season with an ankle injury. Krug is 0-4-4, minus-10, in 15 career games against the Caps. 1. Boston has been shooting in bad luck in their eight-game slide. Their 275 shots on goal are 13th-most in that span, but their shooting percentage of 8.0 is third-worst in the league. 2. No team in the Eastern Conference teams averages more penalty minutes (9:55 per game) than the Bruins (9:51). 3. Boston has the third-fewest blocked shot total in the league (656), ahead of only Calgary (653) and Buffalo (632). 4. A combination of statistics suggests that Boston can be a punishing team. Only three teams in the league have more than 1,000 credited hits and more than 450 takeaways – Vegas (1,479/564), Carolina (1,330/554), and Boston (1,190/451). 5. Despite their 2-3-3 record in their last eight games, the Bruins have the best shot attempts-for percentage at 5-on-5 over that span (57.24 percent). 1. No team in the Eastern Conference has had more power play chances on home ice so far this season than the Caps. Their 91 chances is tied with the Montreal Canadiens. 2. On the other side, no team in the league has been shorthanded on home ice as often as the Caps (90), and only the Detroit Red Wings have allowed more power play goals on home ice (22) than the Caps (21, tied with three other teams). 3. The Caps have the second-best shooting percentage on home ice among Eastern Conference teams (11.1). Only Tampa Bay is better (13.4). 5. Washington is 28th in the league in shot attempts-for percentage at 5-on-5 on home ice (47.77 percent). Defenseman Zdeno Chara broke into the NHL in the 1997-1998 season with the New York Islanders. He dressed for 25 games that season but did not score a goal. Nevertheless, since that season, no defenseman in the league has as many goals scored as Chara (198, two more than Shea Weber). This season, though, the goal scoring has dried up some. Since recording a pair of goals on October 25th in a 3-0 win over the Philadelphia Flyers, Chara is without a goal, a streak of 22 games. The last goal he scored on the road came in Game 2 of the season when he scored in a 4-0 win over the Buffalo Sabres, the only other game in which he has a goal this season (Chara scoring seems to have some relationship to Bruin shutouts this season). It is hardly surprising that as Chara nears his 42nd birthday (March 18th), his scoring has fallen off, but fallen off it has. After posting nine straight seasons of 40 or more points between the Ottawa Senators and the Bruins (from 2003-2004 through 2013-2014, not including the abbreviated 2012-2013 season), he has not hit the 40-point mark in four seasons preceding this one and topped 30 points once (37 points in 2015-2016). He has already missed 19 games this season to a knee injury, a likely contributor to his 3-4-7, even, scoring line in 32 games played. While not quite the minutes eater he was earlier in his career, this season to date continues an unbroken string of seasons this century (since 1999-2000, in fact) in which he averaged more than 20 minutes per game (20:46 per game this season). In 71 career games against the Caps, Chara is 7-19-26, plus-1. Of note, Chara has scored only one regular season career goal in 34 games in Washington, that coming in a 4-3 overtime loss to the Caps on March 5, 2013. Last season, Dmitry Orlov was second to John Carlson among Capitals defensemen in goals (10, to Carlson’s 15), points (31, to Carlson’s 68), and game-winning goals (two, to Carlson’s four). He was a plus-10 and dressed for all 82 games. He added another pair of goals and eight points in the postseason run to the Stanley Cup. He was a solid top-four defenseman for last year’s champs. This season, things have not gone nearly as well. Orlov has appeared in all 51 games (the only Capitals defenseman to do so), but his 3-12-15, minus-11, scoring line his running behind last season. He has struggled more since mid-December. After recording an assist in a 4-3 win over the Buffalo Sabres on December 15th to give him three points over a five-game span, Orlov is 1-2-3, minus-8, in 19 games. That goal is his only goal over his last 34 games despite recording 38 shots on goal (2.6 percent shooting). If Orlov is getting a lot of ice time, it might not be a good sign. The Caps are 0-3-1 in the four games this season in which he skated more than 25 minutes. In 16 such games in his career, the Caps are 5-7-4. Orlov is 0-6-6, plus-6, in 17 career games against Boston. In physics, it is Newton’s First Law of Motion (an object in motion stays in motion unless acted upon by an external force). In gaming, it is “bet the streak.” Someday, an external force will act upon the Capitals-Bruins rivalry. Someday, the bettor betting the streak will lose. But 14 games? In a row? Since 2014?